A few days earlier while Irons, 34, installed the plants for the Social Ecologies exhibition at the Gallery at Industry City, she had carefully identified the plant as hemp, a non-psychotropic sibling of marijuana. An adjunct professor at Brown University in Providence, Rhode Island, Irons is an eco-artist. Driven by a background in art and science, her process connects the two worlds. She seeks out scientists and uses her art to communicate between the human and natural worlds, particularly in urban environments. Her current work explores ecological concepts of invasion and diversity, and their human counterparts of immigration and gentrification. The concrete island becomes the background for the surprisingly vibrant interplay between people and plants. For the last few years Irons has been using the weeds of Brooklyn as her inspiration, in photos, sculptures, and paintings. Many of these works, like the new “Sanctuary for Weedy Species” in Industry City, illustrate the importance of nature to people in cities. Although ecologists appreciate that Irons brings aspects of ecology into the art world, some question whether her work accurately represents ecological principles, particularly those relating to invasive species. Born in Ukiah, California, she grew up with a love for nature and art. As an undergrad she double-majored in art and environmental science. Nature was the backbone of her art. So when she moved to New York City in 2005 and was suddenly living under skyscrapers, she felt like she was trapped in a metal canyon. She says, “I didn’t know how to be inspired anymore.” So she fled, taking a semester abroad from her graduate program and went to Schiermonnikoog, a pastoral island in the Netherlands. Once there, she was struck by how open the landscape was, even though it wasn’t wilderness. Surrounded by farms and drainage channels she felt free enough to start doing science again. Collecting data is now a major part of Irons’ process. Last summer, for example, she was an artist-in-residence at the Rocky Mountain Biological Laboratory. While interacting with scientists doing research she painted the flight lines of birds and planes across the sky, which she compared to similar paintings she had done in New York. Paul CaraDonna, one of the founders of the Art-Science Exchange at the lab, was very impressed by Irons’ artistic practice. “The way she interacted with her surroundings in the mountains, and the way she set out to do her art was exactly the same way the ecologists at the lab were doing it,” he says. A video for the “Flight Lines” project created at the Rocky Mountain Biological Laboratory showing how flight paths are captured and turned into paintings. [Video Credit: Ellie Irons, “Flight Lines (Butterflies, Bank of the East River, Gothic, Colorado, 6/23/15, 10:50 am),” 2015]. Irons’ art comes in many forms — digital drawings, traditional paintings, photo-essays and living sculpture. Her work with invasive species has helped bring ecology and plants out of labs and into a broader context. 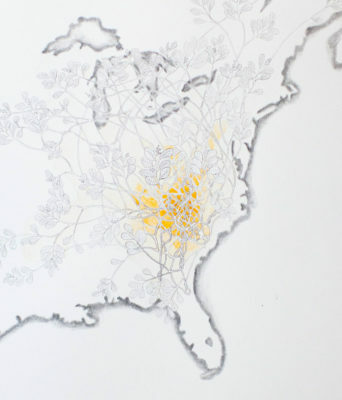 Amy Berkov, a tropical ecologist at the City University of New York, says she is particularly struck by Irons’ paintings of invasive plants made with pigments she extracted from the plants herself. “Ellie takes the pigments out of plants, puts them on paper and people can see them there,” she says. Otherwise, these plants are overlooked and become practically invisible. 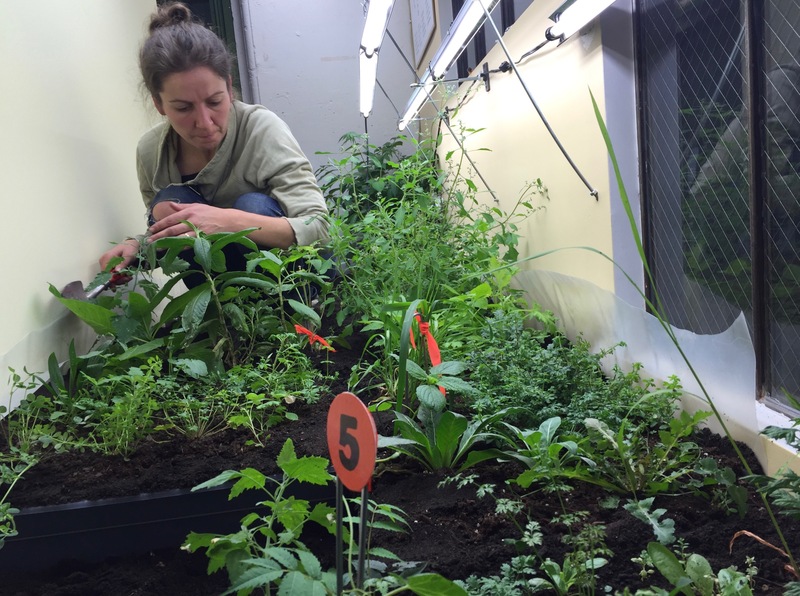 Berkov co-taught a class with Irons, but they don’t always see eye-to-eye — Irons’ weedy garden and her seed library of Brooklyn weeds make Berkov uncomfortable. “I’m less likely to be enthralled with, or want people to be dispersing non-native weeds,” she says, pointing out that non-natives make up most of the plants in New York City. The issue is that invasive plants have the potential to push out native species that have been in an area for hundreds of years. During this process, invasive plants can create monocultures — areas where only one type of plant survives. Without diversity of plants, a single virus, a drought or a flood has the potential to wipe out the entire ecosystem. Native plants also typically support a greater variety of insect and animal life, adding diversity and resilience to the rest of the ecosystem. But Sasha Wright, an ecologist at the Fashion Institute of New York, says that in areas like New York the focus should be less on whether plants are native and more on diversity itself. In New York, street plants must endure extreme conditions like salt, heat and soil compaction, and areas with a larger number of species are better able to survive a crisis — no matter what their origins. When people immigrate to New York, their plants come too, accidental travelers in shoe soles and shipping containers, which is why Iron’s garden contains species from all over the world, alongside the native plants. And as she digs a final planter, the severely worn-down soles of her own boots exposed, she points out that these weedy plants, survivors that cling to the little soil they get, face the same problems as people. As gentrification sprouts expensive condos on what were once vacant weedy lots, people and plants are being pushed out of Brooklyn — maybe one day including Irons herself. As she finishes up the installation, two Latino workmen in heavy boots and bright orange vests peer into the gallery from the hall. They’ve noticed the plant labels. “Central America, number five,” says one to the other, and they crane their heads until they find the bright orange 5 next to a morning glory. They smile, perhaps happy to be represented, and go on their way. Editor’s note: The story has been altered to clarify that Irons identified the plant photographed by a gallery visitor as hemp, not marijuana. The curator reports that the plant has since been removed from the exhibit. Dyani Sabin spent her undergraduate career at Oberlin College chasing crayfish through streams, stage-managing musicals, and reading Russian literature. Upon graduating with her biology degree in 2014, she stalled going into research and became the evening supervisor at a library instead. There, she discovered science journalism, and fell in love with exploring the relationship between science and people. Thrilled to be a SHERPie, she loves horseback riding, exclaiming about cool birds, and knitting.